The glitch that stalled the private Dragon spacecraft's cargo delivery to the International Space Station today gave its handlers quite a jolt. 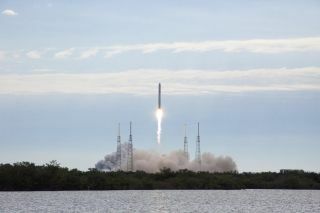 SpaceX's unmanned Dragon capsule launched smoothly into orbit this morning (March 1), but its thrusters failed to fully activate after the spacecraft separated from its Falcon 9 rocket. Just one of four thruster "pods" was working normally at first, imperiling SpaceX's second contracted supply flight for NASA. "It was a little frightening there," SpaceX founder and CEO Elon Musk told reporters in a mission update today. "If we left it at this orbit without raising perigee, it would re-enter within a day or two," Musk said. But the outlook has improved since the first few minutes after launch. SpaceX engineers have now brought all four pods online and executed an orbit-raising burn, Musk reported via Twitter, potentially clearing the way for an eventual space station rendezvous. "Orbit raising burn successful. Dragon back on track," Musk wrote in a Twitter post today. If everything goes swimmingly from here on out, berthing could occur as early as Sunday (March 3), NASA officials said — a day later than called for in the original plan. The thruster issue was the first glitch Dragon has suffered in four trips to space. The capsule performed pretty much flawlessly on a test flight to Earth orbit and back, a historic demonstration mission to the space station in May 2012 and its first contracted cargo run to the orbiting lab last October. So Musk isn't too concerned about Dragon's prospects going forward. "I think it's an anomaly," he said. "I think it was a glitch of some kind and not a serious thing if we're able to come back online." SpaceX holds a $1.6 billion deal with NASA to make 12 robotic cargo flights to the space station. The Dragon capsule is carrying 1,200 pounds (544 kilograms) of scientific experiments and supplies to the orbiting lab and is slated to bring 2,300 pounds (1,043 kg) of material back down to Earth. Dragon was originally supposed to come home March 25, but the mission's timeline remains up in the air until the thruster glitches are definitively sorted out and Dragon is cleared to dock with the station. Follow SPACE.com senior writer Mike Wall on Twitter @michaeldwall or SPACE.com @Spacedotcom. We're also on Facebook and Google+. This article was first published on SPACE.com.